This is Percy. My new plant. We don't know what kind of plant it is, so I just decided to call him Percy. I have this thing that I always need to alliterate the name with the thing. Percy the Plant. Since this is the only living thing in our house, aside from Caleb and me, I decided he needed to make an appearance on the blog. My friend Katherine gave him too me and I was so excited that I left my purse at their house and got home and never even realized it. Thankfully my other friend Katherine brought it to me. Anyway, I have now successfully kept Percy alive for 10 days! I waited this long to make sure he would still be alive instead of introducing him the first day I got him only to have him die three days later. I'm not very good with plants. In China I had a baby cactus that I kept on the balcony off of my room. It died. How does someone kill a cactus? And one summer my sister Kristin asked me to water their plants while they were away, since I was planning on going over to lay out by the pool anyway. For some reason I thought it would be okay to water the plants with the pool water. The plants were all dead when they got home. But my days of plant killer are over. I'm turning over a new leaf (no pun intended) and will keep Percy alive! 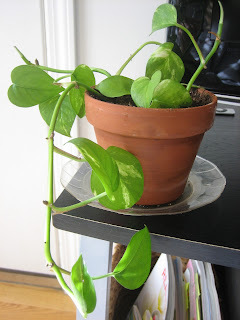 Percy looks like philodendron. If so he will be hard to kill. Granddad's mom had one that she twistd around a mirror in her dining room and another that she twirled around the banister on a staircase. Have fun with this new addition to your family. I killed a bamboo plant once, so don't feel bad about killing a cactus.